This project ended successfully on 12/10/2013 14:00! THE DIGITAL ALBUM: You receive our new album as a digital download on the day of the release. THE VIP ALBUM: You’re cordially invited to attend our release party as a VIP guest! You’ll be able to enjoy dinner with all present bands, cool backstage beverages included as well. Furthermore, all VIP guests will receive their album directly at the concert (ALBUM VERSION: The Personal Album). THE GREAT ALBUM: It’s getting fancy: The great version of our new album! Inside a wooden box you’ll find our new CD (ALBUM VERSION: The Personal Album), a VIP pass for our release party, a special Abinchova liquor, a band poster, signed band photos of every member, and more! THE HARD-HITTING ALBUM: Receive a drum cymbal that has seen the wrath of metal music – With the signatures of all band members and a dedication on it as well! Hang it on your wall, use it as a dinner plate, or just continue to play it – everything’s possible! Additionally you’ll also receive our new CD (ALBUM VERSION: The Great Album). THE VERSATILE ALBUM: It doesn’t get much more personal: Receive from every band member a symbolic object from their everyday band life. Be it a violin bow, handwritten lyrics, or guitar strings – There’s something from everyone in the band! Additionally you’ll also receive our new CD (ALBUM VERSION: The Great Album). THE LEGENDARY ALBUM: We part ways with a dear companion: our band logo backdrop, which has been with us since our first concert 2009, is looking for a new home! The ultimate fan memorabilia for your home, garage, or cover band. Additionally you’ll also receive our new CD (ALBUM VERSION: The Great Album). THE GODLY ALBUM: The holy grail of all album versions! You’ll become a permanent guest at our gigs, because from now on, you’ll attend all our concerts for free until the end of time. Drop by whenever you want, you’ll always get in. Additionally you’ll also receive our new CD (ALBUM VERSION: The Great Album). 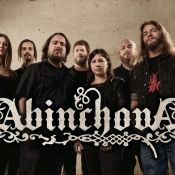 Heartfelt folk metal is the prime priority of the seven musicians of Abinchova. Melodic folk tunes and crushing metal riffs characterize the sound of this band. Lyrically, the group has dedicated itself to the telling of old tales and myths, which are brought to you by screams and classical female vocals. Abinchova – A wave of music that transforms every concert into a beer soaked festivity!